This product is featured in: 23 things you should know about Baikal shotguns and Baikal Scout combination gun. Some of the first Baikal shotguns to hit the UK market years ago were side-by-sides. These early models were not very sophisticated compared with the same maker’s over-unders, which soon found their niche in the marketplace. The side-by-side models always seemed to remain in the shadow of their better-known stablemate. So, what is the current model really like and are things likely to change? The MP43 is a side-by-side, and its extra initials (E-1C) denote that it is an ejector with a single selective trigger. It displays little concession to either UK or European niceties such as glossy, finished barrels, full coverage imitation engraving or a nice shiny polished action body. The MP43E-1C is a plain gun with only a touch of simple decoration to relieve the all-over black finish of the metalwork. Styling is best described as unusual and there is no attempt to hide its obviously machine-made mass-produced origins. Yet because of this it has an odd attraction; a plain Jane it may be, but at the same time it’s an honest gun. This shotgun appears to have all the attributes of a strong tool made to do a job. The Russians are good metallurgists, and the steel on Baikal guns has always been of high quality. The finish, by comparison, has never been a strong point: the barrels on this gun, for example, exhibit signs of machine polishing on the outside over some fairly basic striking up. Internally, where it matters, it is a completely different story and it has beautifully straight chrome-lined bores. This is what one tends to find with Baikals. The bits that really matter are done right; the rest just does the job. Another example of this is the matting on the broad and chunky raised top rib. It carries a fine and wiggly detailed pattern reminiscent of many pre-war Birmingham guns. 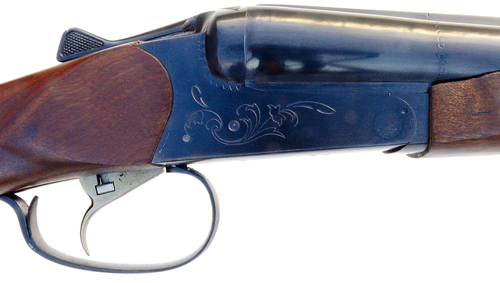 On this gun it seems a complicated, albeit attractive, way of producing a non-glare finish. The detail on the three short screw-in chokes is also good. They are visibly marked up with their suitability for lead and steel shot; for example, a choke will be marked IC lead/IM steel. If only lead appears on the choke it means it is not suitable for steel shot. All carry the usual notch markings relating to the choke patterns normally produced with lead shot. The proof pressure on this gun is not the same as superior proof, which means you should use the reduced load steel shot cartridges. In the handling department this gun proved to be a bit front-heavy, which is not surprising as the balance point is a good inch in front of the action cross-pin (where the barrels pivot). This gives it a quite deliberate feel, rather like some competition guns, but without quite so much weight. 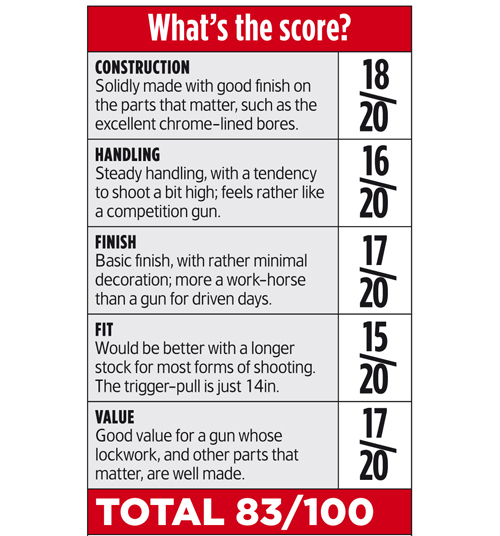 Even so, at 7.3/4lb it is not lightweight for a side-by-side, but considering that many live quarry shooters now use over-unders of a similar weight, it shouldn?t be regarded as a particular disadvantage. Part of the handling characteristics are influenced by the short stock made from a lightweight grade of wood. With the single trigger set well back in the trigger-guard, the length of pull is less than 14in. While sometimes, dependent upon the positioning of the pistol grip, you can get away with this, for me, at more than 6ft tall, it did feel short. The lockwork is surprisingly complex, but well made and, while it follows a boxlock layout, the detail has evolved to become Baikal?s own design. Ejectors are permanently sprung and push against the face of the standing breech when closing the gun, which contributes towards a slight stiffness in operation. 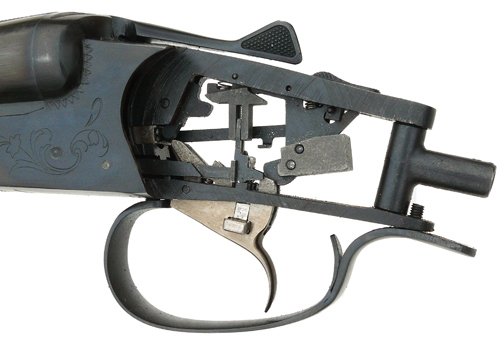 The single trigger incorporates a simple means of first barrel selection. A bar located within the body of the trigger is pushed from side-to-side and a raised arm pushes against the sear that is selected: right for the right barrel, left for left ? it couldn?t be easier. The first thing noticeable was that this gun shot high, a bit like a trap gun. However, both barrels shot consistently to the point of aim and results were much the same, even when swapping chokes from one barrel to another. Trigger-pulls proved short and crisp and ejection of fired cases was more like a British side-by-side than the wham-bang associated with many over-unders. Cartridges covered a range from 28g to 46g lead loads and 32g of steel. Recoil with the heavier loads was noticeable, due to the straight-line recoil in this gun, so the generously ventilated recoil pad proved its worth as an aid to soaking this up. This MP43 shot better patterns with heavier loads and the most effective patterns were produced with reduced load steel shot. 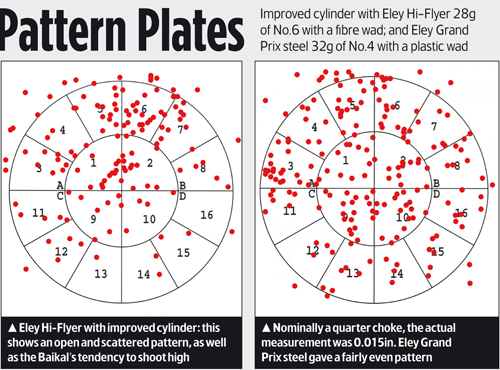 Cartridge makes that were tried included Eley, Fiocchi, Gamebore and Lyalvale Express. In reality one is unlikely to take a basic gun such as this on a smart driven day, but it fits the bill well for the vermin or pigeon shooter and in many ways displays the same rugged features as some of the pre-war “Brummagem” guns. With its liking for heavier lead shot loads and steel shot, plus other features such as 3in chambering, sling swivels and the semi-beavertail fore-end, the MP43 certainly has all the makings of an excellent general purpose gun. When wearing thick clothing the short stock is not a disadvantage and the large amount of space in the trigger-guard gives ample room for a gloved finger when out on a bitter winter’s morning. Something that can be said for the Baikal side-by-side: it isn’t pretty, but it is very practical. The Baikal MP43E-1C is a no-nonsense, robust gun. While the finish is basic, with only simple decoration, the parts that matter are well made. It feels solid and is certainly strong: a tough tool that could be used in a harsh environment and is unlikely to let you down.